← Our website is LIVE! 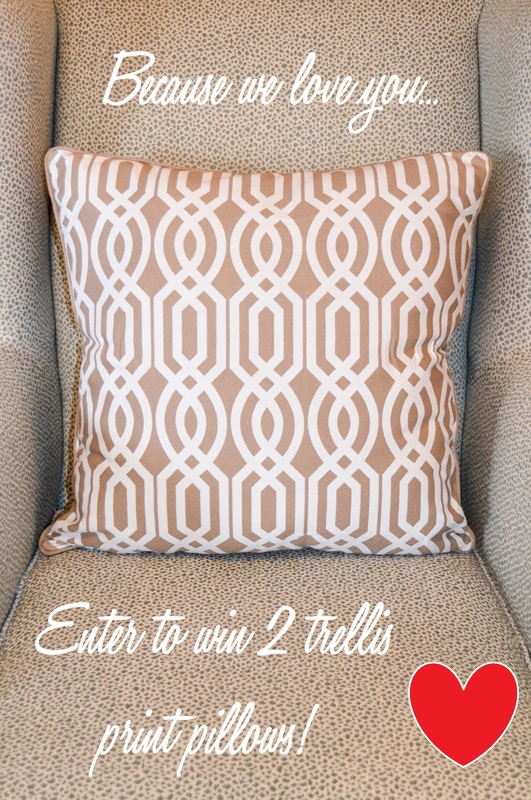 On this heart filled day, we are giving away 2 trellis print pillows! Leave us a comment below letting us know where you would put these comfy pillows and don’t forget to put your email! For extra entries, “LIKE” our Facebook page, comment on our post about the giveaway or tweet the link to this post, copy us @EmbellishInt so we can track your tweets. All together you can get an extra 3 entries. The contest will run until Monday until we select a lucky winner. Good luck!!! For any questions, email us at info@embellish-interiors.com. They’d be so perfect on my super comfy couch in the lounge room. The only problem is I might find it difficult to not sleep there with the beautiful soft cushions instead of my less comfy bed!